So Luke did not know Matthew after all? Side 1: Matthew and Luke used both Mark and Q. Side 2: There was no Q: Matthew used Mark and Luke used both Matthew and Mark. One of the arguments against #2 is that it is inconceivable that Luke would have so thoroughly revised and restructured Matthew (especially the nativity story and the Sermon on the Mount) if he were using Matthew. Opposed to this argument is the claim that such a revision is not inconceivable. I tended to favour the latter. So on that point the two sides cannot be resolved. 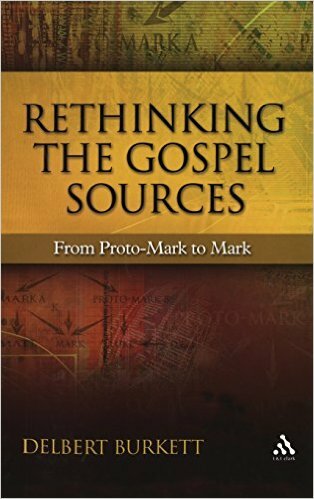 As I continue to read Delbert Burkett’s Rethinking the Gospel Source: From Proto-Mark to Mark I am wondering if the scales can be tipped in favour or one side after all. And what tips the balance? Silence. Roaring silence. Before continuing, though, I need to apologize to Delbert Burkett for leaving aside in this post the central thrust of his argument. His primary argument is that neither the Gospel of Matthew nor the Gospel of Luke was composed with any awareness of the Gospel of Mark. Rather, all three synoptic gospels were drawing upon other sources now lost. But for now I’m only addressing the question that Luke knew and decided to change much in the Gospel of Matthew. Used by Matthew 90 times. Luke parallels 40 of passages in Matthew using τότε but Luke only uses τότε 7 times in those. 33 times he has avoided using Matthew’s τότε. Not that Luke had an aversion to the word because he uses it in other passages as well, 21 times in Acts and 8 times in places in his gospel that do not parallel Matthew. Matthew uses this word 52 times. Even though 27 of those passages in Matthew are paralleled in Luke, the word appears only 5 times in those 27 passages. But Luke is happy to use the word 5 times elsewhere in his gospel and 10 times in Acts.